Our Real Estate Brokers believe in homeownership and understand why it is an essential part of the American Dream. We want to be part of this massive accomplishment for our Buyer and Seller Clients. We guide, advise, support and challenge our Buyer and Seller clients towards achieving their real estate goals. We are grateful to be involved in such meaningful moments in our clients’ lives. Our belief in homeownership is why our Brokers are all are passionate about our business. We offer a Free consultation to those considering a move. Please contact us if we can be of service. You will find us available and responsive. Meet Our Brokers. There are several reasons why we strongly believe in homeownership. We can’t stand the idea of people throwing their money away on renting!! Hard-working people deserve the comfort and security that homeownership offers. Homeownership is an indication of success and sacrifice of its owners. Homeownership is one of the best ways to build wealth. Homeownership contributes to economic growth and employment opportunities. A home investment is not only subject to market fluctuations, it is a unique investment that can owners can increase its value by improving upon it. Homeowners are embedded into the same neighborhood and community for longer, increasing housing stability and social connections. We want to help our clients build wealth by leveraging their real estate to expand their real estate portfolio. 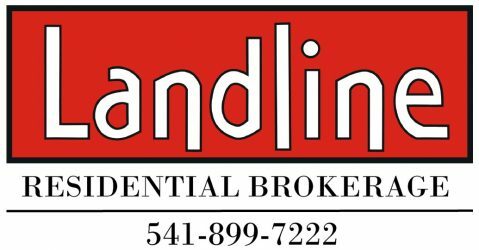 Landline Real Estate LLC is a healthy second generation Real Estate Brokerage, serving Buyers and Sellers in Jackson County Oregon since 1987. We are a boutique real estate brokerage where you can expect above average representation in any transaction from a vacant piece of land to a sprawling estate. Our clients can rest assured that we will assist in creating a smooth and skilled real estate transaction, with hard work, customer service and professionalism the keystone of our office culture. Our Real Estate Brokers are experienced and results-oriented. We offer high-quality specialized marketing products and methods to obtain the most amount of money in the least amount of time. We appreciate that our Clients lead demanding personal and professional lives, requiring high tech and fast paced Real Estate Sales. We are certain that if we understand our client’s priorities, concerns, intentions and goals, we become exponentially more valuable to them. We have a consultative and goal-driven approach to Real Estate sales and marketing. With our experience and market understanding, we are confident in our ability to provide meaningful direction to our Clients. We want our Buyers and Sellers to consider Landline Real Estate their Real Estate Brokerage for life. We are a technically oriented company, both for efficiency, but also for impact and effectiveness. We are aggressive in our marketing. We expect to get our Featured Real Estate listings seen, shown, and sold for top dollar. We direct our marketing to Buyers, but we also heavily market to fellow Real Estate Brokers and other local Real Estate Professionals and affiliates. Many real estate sales have moments of difficulty. From financing issues, condition issues, personal problems, upsets to anxiousness. Part of our role in Real Estate is to find solutions, to assert ideas, to advocate for our clients. We are here to serve our Client’s real estate needs and relieve the stress of a move while helping them achieve their real estate and financial goals. We are proud to represent incredible people, who repeatedly hire us, and send us referrals. We are licensed to conduct Real Estate Transactions in the entire State of Oregon, with most business occurring in Jackson County Oregon. It is not uncommon for us to represent sales in Josephine County Oregon. Selling? If you are considering selling your home, we offer a free market analysis because it can be helpful in making a decision. A market analysis is a service that our Real Estate Agents offer to potential Sellers. The purpose is to determine the current market value range of your real estate. We review recent comparable sales. A key factor in making decisions about Real Estate is often knowing the likely sales price. All we need to start is your address, provide your address here. Upsizing homes, downsizing homes, or moving to or from Jackson County, we are here to make the process less stressful. We can help you make decisions based on your circumstances, and help you understand all of your options. While we are always looking for business, sometimes it is not the right time for a move. You can count on us to offer honest feedback. If you are considering buying Real Estate in Jackson County Oregon, our Real Estate Brokers are capable and able to serve you in an organized and customized manner. Not prequalified yet for a loan, no problem! If we know your situation, we can help get you to the right lender for your situation. Our Real Estate Brokers can work together with your lender and find the homes that can work for you and your loan type. Review our Featured Listings to see what our Seller Clients currently have for sale. We can set you up on a personalized search to only show you the results that are within your criteria. The results will include all available MLS homes in the entire County. You can select the ones you would like to tour; then we take you house shopping. Our Real Estate Brokers all have virtual offices that they operate, Landline is a high tech Real Estate Brokerage. Our Brokers are all members of Southern Oregon MLS SOMLS, Rogue Valley Association of Realtors, Oregon Real Estate Agency, and the National Association of Realtors. Our Real Estate Brokers are both Buyers’ Brokers and Sellers’ Brokers. All are licensed Realtors in the State of Oregon. Our primary service area is Jackson County. It is not uncommon for our Realtors to list and sell real estate in Josephine County as well. Extended areas are considered as well. If you want to contact a specific Real Estate Broker, See Our Real Estate Brokers. For immediate assistance, please call our office. For less urgent matters, you are welcome to send us a message. Please provide details so we can have the right Broker return your call. Available By Appointment. We are available on weeknights and weekends, as well as regular business hours. We appreciate your interest in doing business with us! Available during regular business hours, weeknights and weekends. We come to you, and try to be available at your convenience!